1. Establish a Living Wage Unit . This unit would calculate annually the living wage rate for communities/regions throughout the province based the Living Wage for Families calculation methodology. The work of this unit should be guided by an advisory board of experts, community organizations, labour, and business. The unit would also promote the benefits of living wages throughout the province, and encourage employers to adopt the living wage in the communities where they operate. 2. Establish and implement a pilot Living Wage Policy in a relevant Provincial Government ministry or agency. The living wage policy will apply to all ministry/agency employees (full-time, part time and casual) and all service providers and contractor staff, similar to living wage policies at a local level. After implementation, the above pilot project should be reviewed with a view to extending it throughout all Provincial Government ministries and agencies. 3. Place a moratorium on all future contracting out of provincially-funded services that result in employees receiving less than a living wage. 4. Explore public policy interventions that reduce a family’s living expenses. Reducing families’ living expenses in turn will reduce the living wage rate and make it more affordable for businesses to pay. The BC NDP and the BC Greens expressed an interest in hearing more about our proposal but no party has made a firm commitment in relation to any of the four proposals to date. 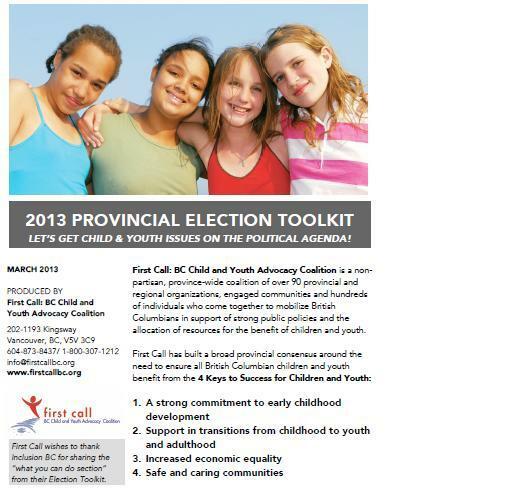 For more details on all the issues relating to children and young people in the forthcoming election go to First Call’s 2013 Online Election Toolkit. For information on poverty reduction go to First Call’s Poverty Report Card and Poverty Reduction Campaign for BC. Would I Vote For You? Visit the Public Health Association of BC’s comprehensive Health Voices Election Toolkit Website http://povertybadforhealth.wordpress.com to learn how you can raise your voice, spread the word and take action to create a healthier, just society. Inclusion BC (formerly the BC Association for Community Living) has produced “Get the Vote Out”, a plain language voting guide to encourage participation in the upcoming provincial election. They have also developed issue fact sheets that are designed to be taken to local candidates. They provide basic information about five different issues: supports to children and families, education, employment, income security and disability supports. Check out the Generation Squeeze Campaign for information on how to get involved in the campaign to get political parties of all stripes to acknowledge the large spending gap between generations. The BC School Trustees Association (BCSTA) has launched the provincial election campaign “Me Too! We Value Public Education” to raise the profile of public education and the important work of public Boards of Education. The Roundtable and the Federation of Community Social Services (FCSS) of BC has produced the Community Counts Campaign. It is an effort to ensure that the issues of social service agencies and, more importantly, the needs of clients and communities, are addressed by all political parties and policy makers. Vote Mental Health 4 All-One Action is a campaign to create public awareness about the issues facing British Columbians with mental illness and addictions and to support a movement for change this provincial election on May 14, 2013.